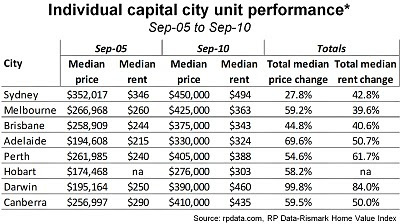 For units, Darwin has again recorded the strongest value growth during the past five years (99.8%) followed by Adelaide (69.6%). 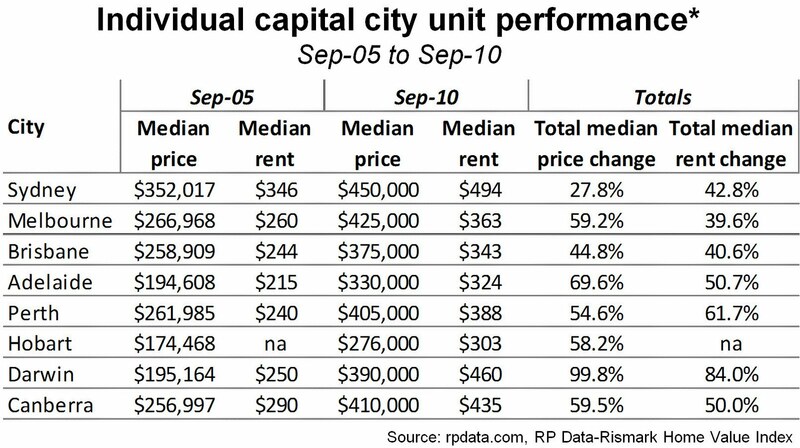 Unit rental growth has well and truly lagged in Sydney (27.8%) and to a lesser extent also in Brisbane (44.8%). Overall the results highlight the virtues of having a long-term hold strategy in relation to property purchases with property values, rents and subsequently yields having historically proven to increase over time. Over the next 12 months we are anticipating fairly flat growth in property values however, we do expect that rents and yields will improve. With an insufficient supply of homes, upwards pressure will remain on housing prices over the long term, however price inflation will be offset by affordability constraints which will hamper prospective purchaser’s ability to enter the residential market. As a result, competition for rental accommodation is likely to intensify and weekly rents will rise. These conditions highlight just how imperative it is that Government’s find a solution to housing supply issues, as the national graphs highlight, over the last five years conditions have been such that either property values have increased, rental rates have increased or both have been climbing. Supply is clearly a large contributor to these prevailing conditions."